Former underage coach, Eddie Seydak has hit out at Derry City. Former Derry City youth coach Eddie Seydak claims a decision to ban him from training the club’s Ulster Senior League team prompted his decision to walk away after more than a decade of service. Last week Seydak, who was a member of the Derry City team that returned to senior football in 1985, became the second high profile member of the club’s youth academy to leave over the space of 10 days, following John Quigg’s departure - a decision which Seydak said left him in an untenable position. The former Limavady United boss, who has been offered jobs north and south of the border since his departure, believes Derry could have been handled Quigg’s departure better and cited it as a significant reason for his resignation last Thursday. “My last few months, I would say, have been embarrassing,” he insisted. “I was asked to do the Ulster Senior League team, which is the club’s reserve team, until the end of the season. John Quigg was helping me but recently I had been banned from training, so I was expected to run the reserve team at the club, but not allowed to attend training sessions and work with players - it was a ludicrous situation. “I’m not going to embarrass the people involved by saying why I was banned, but being told to stay on and run the team while not being permitted to attend training sessions, sums up my situation. “John’s situation could have been handled better and, to be honest, after he left I had no option, staying was untenable for me. “I thought the manner in which the the club rang him and told him not to come back, was shocking but I’m too long in the tooth to fall out with anybody. “Yes, I have had my disagreements but that happens in every club, you just get on with it. “I’ll still be a Derry City supporter and I still do the home matches for Drive 105. I want Derry to do well, especially the young boys like Aidy Delap. “Everyone knows without the chairman the club would be in serious bother. Philip has been absolutely fantastic. He has put his own money in and backed every manager that has come in, but I was shocked that night Declan (Devine) and his backroom team were unveiled. The chairman explicitly said the reason Paddy was brought in was that there weren’t enough young players coming through,” adds Seydak. “Everyone at that Press Conference turned around and looked directly at myself and John Quigg. It was embarrassing for us, but I would refer him to the list of first team players that have come through the youth academy over recent years. “Even in the last home match against Longford, there were around five or six players in the squad that had been brought to the club at a young age. The likes of Aidy (Delap), Conor McDermott and Patrick McClean are another three that spring to mind that we brought to the club and who are now playing in the first team. “All underage players are expected to train four nights a week. If they don’t, they find themselves falling behind and most away matches involve a 10/12 hours day with several journeys to Dublin, Athlone etc. This requires a huge commitment from both players and coaches who, of course, also hold down full-time jobs. “One thing is for sure, if the players do the required work, even if they don’t make the first team, they will leave the club as better players and better citizens. “It also needs to be taken into consideration that the coaches also attend meetings in Dublin, etc, as well as watching matches in Donegal and locally in order to identify the most talented players. Seydak had been part of the Brandywell club’s youth academy since 2005 and he is keen to stress that at no stage did he nor any of the coaching staff, put the focus on results - the aim, according to the Scot, was always about producing players for the first team. “I always remember the first training session myself and Hugh Harkin took. We had six players, that was the height of our academy, so obviously there was work to be done,” he stated. “The important thing to do immediately was to develop relationships with the various associations including the D&D Youth F.A., the Saturday Morning League, the Inishowen and Donegal leagues, which we did. I would also like to take the time to thank the D&D Youth League, the Saturday Morning League, the Inishowen League and Ulster Senior League for all their help and support over the years. “I know last year the D&D was criticised by Kenny Shiels, but I thought that was unfair. 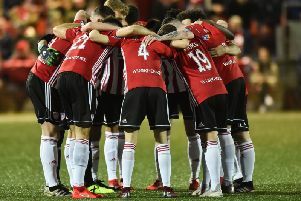 They have been a massive help to Derry City over the years, not just in terms of producing players but also more routine, but no less important things, like helping get pitches for games and training, stuff people don’t normally see or hear about. “After those relationships were up and running, we started to get the players in and things were going well. “Stephen Kenny was manager and he had a really good team so we knew we had to really up the ante at that stage. In fact we had a young player from Top of the Hill, Darren Harkin, who was one of the best players we ever had but he couldn’t get into Stephen’s first team because Derry had (Barry) Molloy, (Ciaran) Martyn, (Kevin) Deery and (Ruaidhri) Higgins. It was around that time we had to step up a gear. “I decided around 2007 to get Paul Roddy on-board to do some strength and conditioning which meant we were doing three sessions a week. We then increased that to four sessions a week and t things really started taking off. “The extra sessions were not just about fitness, it was giving the young players confidence and belief in themselves, teaching mental discipline and from then on, we’ve had a plethora of players with the ability and the attitude to get into the first team. 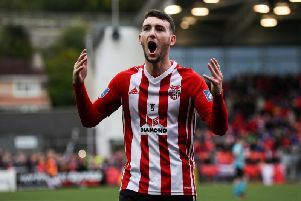 “Players such as Conor McDermott, Shane McEleney, Ryan McBride, Ben Doherty, Patrick McClean, Michael Duffy, Barry McNamee, Ciaron Harkin, Ronan Curtis, Rory Holden, Georgie Kelly, Darren McCauley, James McClean, David McDaid, Ryan Curran, Cathal Farren, Nathan Boyle, Josh Daniels, Marc Brolly, Seamus Sharkey, Tony McNamee, Eugene Ferry, Raymond Foy, Sam Todd, Ronan Wilson, Aaron Harkin, Shane McNamee, Aidy Delap and Evan Tweed. “That’s off the top of my head and apologies to those I’ve omitted. “We never focused on results. There has been a lot of criticism on social media because we lost matches, sometimes heavily, but what people who aren’t involved don’t understand is the bigger picture. Our aim was not to win trophies but to develop players. “For instance, half of our U19 squad from last season could play at that age for the next two years which decimates the U17 team. That snowballs down throughout each squad, but that’s part of the job. We deliberately push the players out of their comfort zone to help them fulfil potential. That may not bring trophies because the players are often playing ahead of themselves but it helps players develop. Seydak says seeing young players further their careers, not just on the pitch but also away from the game, makes him very proud of the work they did. “A large number of young Derry players also gained international recognition at various levels, ranging from schoolboy to senior, both north and south of the border,” he explained. “Once these players progress to the first team it’s then down to the skill and patience of the first team manager to nurture and develop them further. Some have had these qualities, some have not. Despite his disappointment at how his time at the Brandywell was brought to a close, Seydak said he wished Paddy McCourt’s new regime nothing but success for the future. When contacted for a response Derry City refused to comment on Seydak’s departure.